Schrader's Smoker Service is a family owned and operated smoker service located in Florida, and serving the southeast USA. Our sales department offers the best barbecue smokers on the planet! Our service department is fast and dependable. We do it right the first time! Schrader's has an extensive parts inventory,if your bbq smoker should need parts. Our service department can handle the installation, or if you are a do-it-yourself person, we can ship the parts to you. If you need to relocate a smoker installation, we can handle that. If your smoker is aging, and needs a complete rebuild, Schrader's can rebuild your smoker so that it will be like new. Schrader's tech support is available to answer your questions and assist you with decisions concerning upgrades, etc. 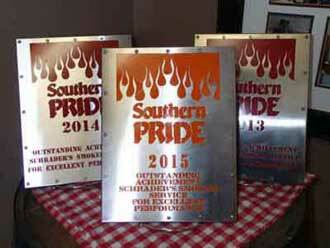 Bottom line is Schrader's is a full service Southern Pride bar-b-que smoker service, offering: Sales, Service, Parts, Hoods, Fans, Relocation, Rebuilding, & Tech Support.